In-form filly Le Castile is delivering exactly what trainer Mark Blackie has been expecting. 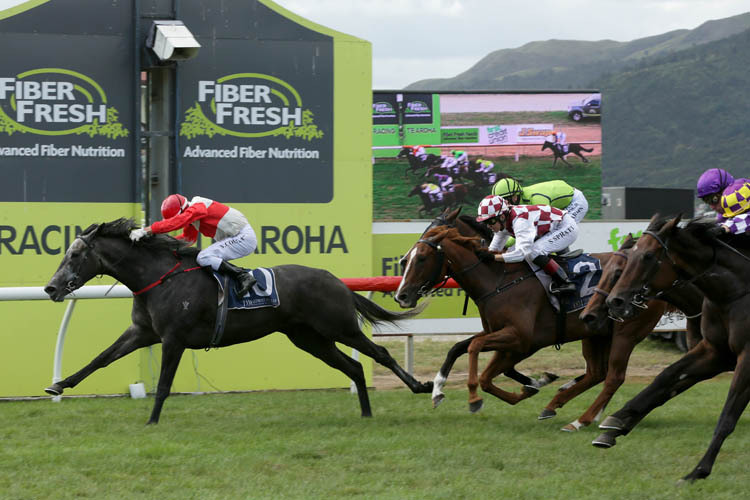 The daughter of Dalghar won for the second time in her short career on Saturday when she accounted for a tidy field of three-year-olds in the Pyramid Trucking 7 f at Te Aroha. “I’ve always had a good opinion of this filly and that’s a great win,” the Tauranga horseman said. Successful in maiden company at Te Teko last month, Le Castile settled in the trail and once clear in the run home she rounded off strongly. Blackie is unsure of the grey’s immediate future, but he has ruled out a tilt at the Gr.3 Cambridge Breeders’ Stakes (1200m) at Te Rapa in a fortnight’s time. “She’s really looking for a mile now,” he said. “I’ll have a look at the programmes, but she doesn’t like wet tracks. Le Castile was again ridden by Vinnie Colgan, who said he had few concerns during the race. Le Castile had a head to spare at the post from the well-backed Sacred Day, who powered home from the back of the field. Lincoln Raider’s effort for third was another eye-catching performance after he missed the start and got home strongly from last.